Secondary trading in Moscow Exchange shares started on the MICEX in mid-February. The issuer managed to find more investors at the 11th hour and lifted the IPO price from the lower range. Still, a limited number of big investors is unlikely to ensure high trading volumes for the stock over the next few months. The Moscow Exchange has seen the growth of 2.29 percent since its IPO this week. Experts view the trend as positive. The recent listing was the biggest in the history of the Moscow Stock Exchange, according to them. The book for the Moscow Exchange IPO was closed at 7 p.m. on Feb.14. It was oversubscribed twice-over, reaching $1 billion instead of the target of $500 million, two sources close to IPO underwriters told Vedomosti. On the basis of a price of 57 rubles ($2) per share, investors valued Russia’s main trading venue at $4.5 billion. The underwriting banks had valued the exchange at between $4.2 billion and $6 billion. “The result surprised us on the upside — both the placement price and the size of the book,” a manager of a fund that bid for the stock said. Large bids (around $250 million) came from several funds attracted by the Russian Direct Investment Fund (RDIF), according to an employee of an underwriting investment bank; the employee added that these included CIC, Blackrock, and Oppenheimer. CIC was originally planning a $70–100 million bid, but ended up bidding $100 million, an executive of a Russian asset management company said. “Demand was so strong that it forced the RDIF to lower their bid from $100 million to $80 million; but, in general, it may be said that their participation provided substantial support for the placement,” the source told Vedomosti. Individual Russian investors took part in the placement too. Besides global coordinators and bookrunners (Credit Suisse, JPMorgan, Sberbank CIB, VTB Capital, Deutsche Bank, Goldman Sachs, Morgan Stanley, Renaissance Capital, and UBS), the exchange attracted several retail brokers and had something to show for it. BCS had received several dozen bids for several hundred dollars by the evening of Feb. 14, the head of BCS brokerage’s online futures trading, Pavel Sorokovoy, told Vedomosti. Otkrytie received some 130 bids for 10 million rubles ($332,000), the brokerage’s managing director Yuri Mintsev said. Meanwhile, according to a Finam spokesperson, their brokerage company had 117 bids for 11.8 million rubles ($392,000) at 7:45 p.m. Moscow time, on Feb. 14. The offering was made at the exchange’s own venue and was limited to Moscow only. 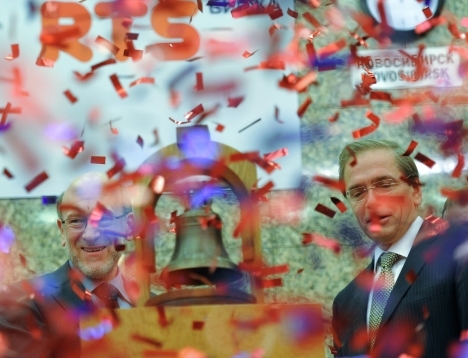 Trading in Moscow Exchange shares started at the Moscow Exchange at 12:05 p.m. Moscow time, on Feb. 14. The story based on materials from Kommersant and Vedomosti.ru.